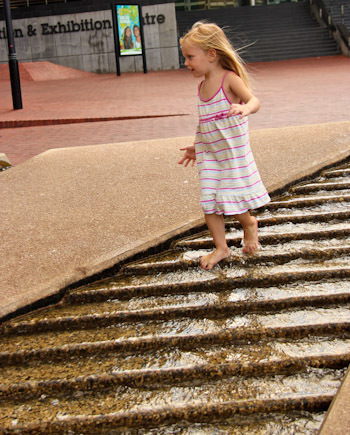 Often we plan outings as educational opportunities for our children. Occasionally, we find that the main lesson in the day is for David and me, as what happened at the Sydney Aquarium today. 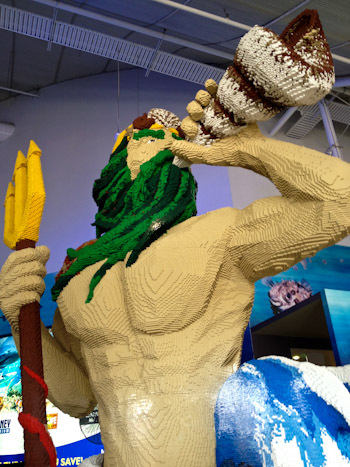 Made completely out of Lego, Poseidon greets visitors to the Sydney Aquarium. It’s school holidays here. We know that. All those children who are usually in school are roaming the street with their parents, looking for exciting activities to stave off the boredom. 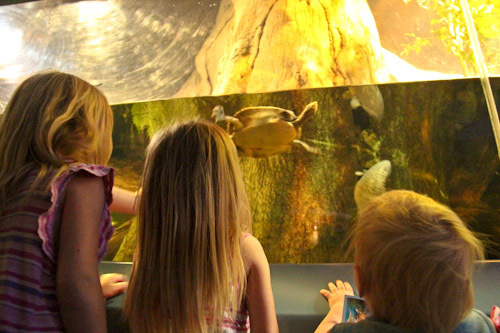 And today most of them chose — like us — to visit the aquarium. 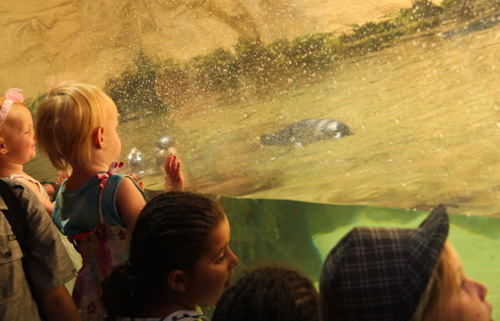 We started off boldly, pushing the pram around the other prams and wading through the people peering at the fish and other water animals on display. 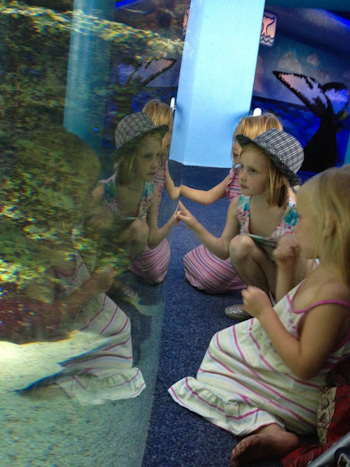 The girls are captivated by the colours of the fish on display. A group of turtles is called "a bale of turtles". 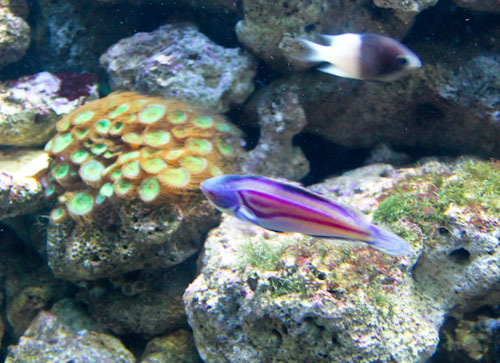 The aquarium’s displays talk a lot about conservation. And their shark exhibit is clearly trying to communicate a message that we must protect sharks in the ocean. However, this is juxtaposed with a video displayed on a huge screen which documents a surfer’s account of surviving a shark attack. 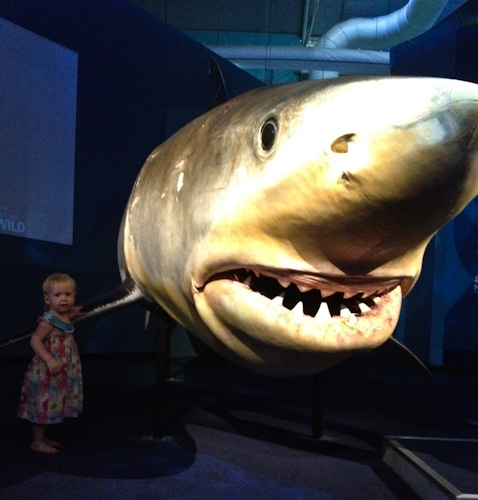 Delaney is happy to be this close to a shark. She has no fear of it. 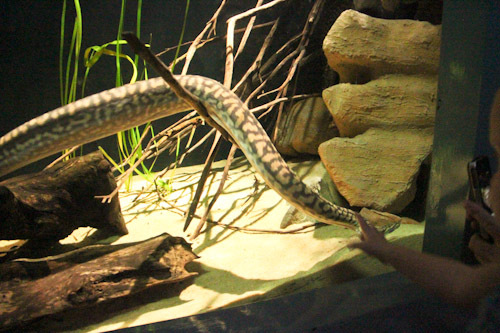 I like watching the sea snakes move though the water — so graceful and smooth. The penguins' antics keep Delaney amused. Brioni particularly likes this sea anemone. She says it looks like peacock feathers. 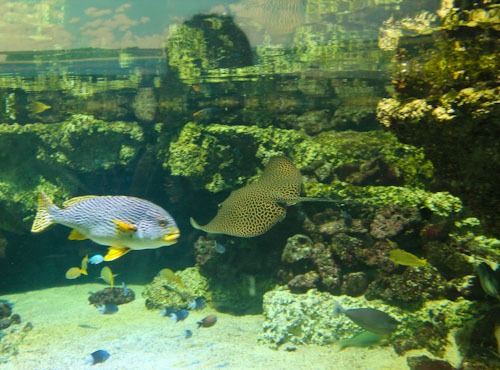 David and I like seeing the different manta rays that glide around the tanks. 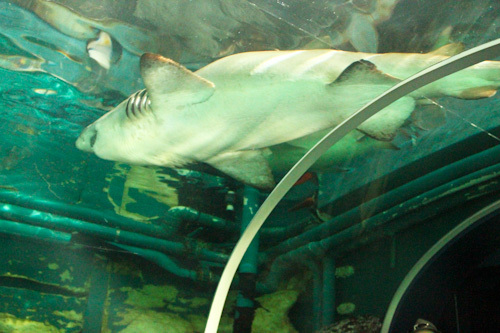 The 100-metre-long tunnel is great for viewing sharks who swim alongside or above us. Some even choose to sleep on the roof of the tunnel because they believe it to be the sea bottom. Somewhere between the snakes and the rays, we realised that we weren’t having fun. It was difficult to keep track of our children in the crowd, the exhibits were crowded, we couldn’t examine the animals at our leisure and Elijah was unsettled. Instead of working together, David and I pulled apart. When we realised that we were fracturing the family, we stopped in a quiet corridor to talk about the situation. David and I learned that each of us was trying to unburden the other but in doing so, we actually created more mental pain. We were projecting how we would feel in these specific circumstances onto the other. This led to our reacting in a way that we would want, however it was not necessarily helpful to each other. Our lesson was to understand each other properly so that we could relieve each other in a way that was appreciated. For instance, when I wear Elijah in the sling, I can gauge how he’s feeling and respond accordingly. David, however, had insisted on wearing Elijah, because he knew that I had been suffering some back and neck pain from sleeping poorly. So, because David was carrying Elijah, I felt torn from my baby. Rather than seeing David’s act as a kindness, I felt that I was being punished. David also made one remark: “You don’t need to take a photo of this, I’ve got it,” as he pulled out his phone. David was trying to save me from what he perceived as a burden — digging through the backpack for our heavy DSLR and composing a picture. However, I — for whom photography is a passion and not a chore — heard David banning me from using the camera. We also needed to stop and redirect Aisha’s attention. Upon entry to the aquarium, she had been given a map of the establishment and was intent on leading us to the shark aquarium. Because Aisha was fixating on a specific destination, she couldn’t enjoy any of the exhibits along the way. She was always trying to hurry the family along and manipulate us to get to where she wanted to be. Her unhappiness was really a lack of appreciation for the journey in favour of her destination; she was forgetting to enjoy the moment she inhabited! When we explained the situation clearly, Aisha could see how she had dug her own little pit of hellish attitude, and we prayed together that she would adjust her mindset accordingly. It’s just silly things that lead to communication breakdowns. And coupled with the stress that we were feeling from navigating the crowds, these negative encounters led us to a point where we just didn’t want to go on. However, by stopping and talking about the situation, we could articulate how we honestly felt and what we wanted for our family’s outing today. The end result was that we left the aquarium without seeing all the attractions, but we’ll go back and get them another time. 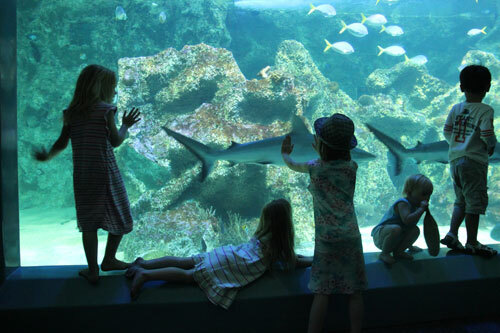 We do get to see some sharks after we lifted up our energy. 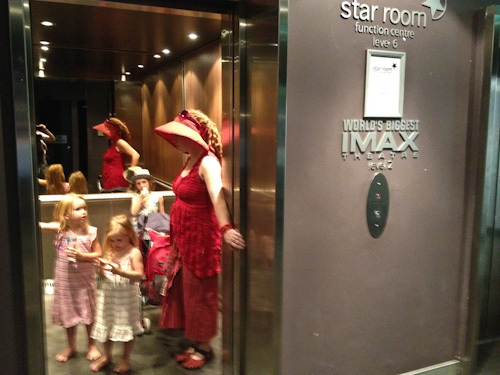 After fuelling up with food, we walked around the harbour to the Imax cinema. Screening was a documentary called Born to be wild featuring, of all things, baby animals. With a family of young girls, baby animals are high on the list of desirables, so we headed in — the perfect antidote to the crowds and arguments! Riding in the lift to the Imax cinema means we get to take turns pressing buttons. After exiting the cinema, we were all in a much better mood. We continued our stroll around Darling Harbour and found some fresh juices and surprisingly good vegetarian food from the over-priced restaurants that line the waterfront. Rejuvenated, we watched the children play — a nice end to the day! Calista giggles at the feel of the water under their feet. 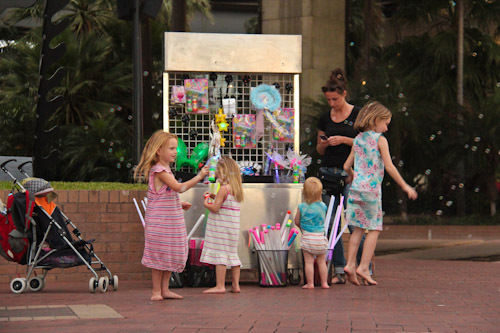 When a savvy seller starts shooting bubbles at us as we run around Darling Harbour, we can't resist buying a bubble gun too! 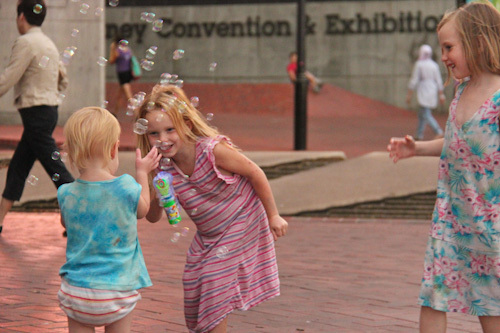 Delaney loves to try to catch the bubbles that her sisters send her way. The view of the city from Darling Harbour is quite different to our perspective yesterday when we were at the top of Sydney Tower. 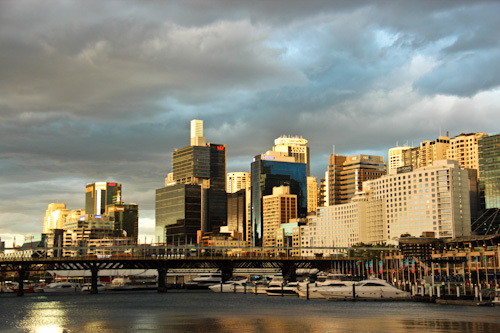 Darling Harbour holds many attractions, but the best ones for us are the lessons that we learn about loving each other. Thank you, Sydney. Great, open and honest post. I agree that mis communication is a huge issue. I will try and draw on this and when feeling put out or sad, talk to my husband sooner rather than later! ..do your children own shoes?